The primary focus of a hospital or health system, is on providing the best possible care for patients while making sure that the business processes are optimized. Consequently, quality is impeccable, and care delivery is streamlined. Our focus at Emorphis is to provide flexible, affordable healthcare solutions and innovative technologies that enable Healthcare organizations to improve business insight, optimize key resources and gain operational efficiencies. We help healthcare organizations to transform, innovate and optimize to build tomorrow’s healthcare enterprise. Our portfolio of applications we have developed in Healthcare are given below along with their features. BMI, Heart rate, Blood Pressure, Etc. Keeps historic data and provides trends in the health parameters over the period of time through interactive graphs. Keeps historic data and provides trends in the sugar parameters over the period of time through interactive graphs. Syncs the data with the remote server. Uses SQLite for data storage. License Management portal to manage authorization for doctors validity to use this application. 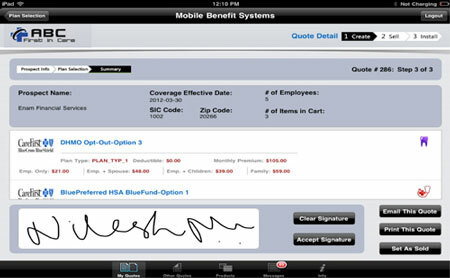 We can provide you with a demo of the applications we have developed for Healthcare. You can email Nigel Jordon, Client Communication at Emorphis. Write to Nigel at nigel@emorphis.com with a suitable date & time slot for a demo.